When you retail a product or provide a service, you expect being paid. But do you know your clients and their solvability? Despite all your safety measures, you are never fully protected from a bad payer or from bankruptcy of a reliable debtor which you sought unfaltering. The export credit insurance is designed to cover Luxembourg exporters against the non-payment risks of their clients, whether those risks arise from political or commercial origin. The foreign investment insurance guarantees the investor against political risks that may arise in the host country. The pre-shipment insurance facility is addressed to Luxembourg importers who need to pay down payments to their foreign suppliers. In many export transactions, the buyer requires the exporter to provide a contract guarantee in favour of the buyer. This could, for example, be a bid bond, an advance payment guarantee or a performance guarantee. ODL can protect both the exporter and the contract guarantee issuer (normally the exporter’s bank) against risks associated with different contract guarantees. The bank may apply for ODL cover, while the insurance for unfair calling is available for the exporter. The insurance covers the risks of insolvency or payment default of your client as well as the political risks such as the risk of currency transfer, war, revolutions, natural disasters and risk of expropriation or government action. The Office du Ducroire may cover the risks arising before the delivery of the goods or service provided, also called « risk of cancellation », as the risk arising after the delivery of the goods or service provided, also called « non-payment risk ». For each exporter, a framework agreement is established, defining the scope of the insured contracts, the applicable premium rates as well as the general insurance conditions. Due to their nature and complexity, special cash transactions are commercial and industrial operations that require a particular approach and follow-up. Special transactions particularly relate to construction works or engineering contracts which extend over several months and whose payment conditions are depending on the progress of the work performed. The execution of a contract entails placing orders and incurring expenses. If the buyer cancels the contract, the exporter is not assured to recover his incurred expenditures. Those outlays may be compensated by the Ducroire. In addition to this cancellation risk, the exporter may incur the risk of non-payment by the buyer once the contract has been executed. The Ducroire may compensate the exporter for the non-payment of the owed amounts. The insurance of special cash transactions does not only protect against the risks of cancellation and payment default of the buyer, but also against political and similar risks, such as the risk of currency transfer, war, revolutions, natural disasters and risk of expropriation or government action. The risk of unfair calling of the bank guarantees to be issued by the exporter may also be covered. For each exporter, a framework agreement is established, defining the scope of the insured contracts as well as the general insurance conditions. The insurance of the commercial contracts is subject to an individual policy fixing the particular conditions as well as the premium. The Office du Ducroire may cover buyer credits funded by banks in order to allow foreign buyers to finance export transactions of contracting equipment, services or construction works, as well as supplier credits which the exporter may arrange for its foreign contractor. Officially supported export credits with repayment terms of two years or more are subject to the OECD Agreement on guidelines for officially supported export credits, commonly known as the OECD Consensus. Under a buyer credit, the bank directly grants the loan to the customer at the request of the exporter in order to finance export transactions of contracting equipment, services or construction works. The exporter can draw on the loan and thus receive cash payment for the delivery of goods and services made under the commercial contract. As a lender, the bank may wish to arrange insurance against the risk of non-payment of the foreign buyer. Thus, the Ducroire may cover the lending bank against the risk that the customer defaults in whole or in part on the buyer credit (principal and interest) or only lately repays the debt. The origins of the non-payment may be twofold, either political or assimilated risk (risk of currency transfer, war, revolutions, natural disasters and risk of expropriation or government action) or commercial/buyer risk. Via its bank, the exporter may offer deferred payments at a fixed interest rate, thanks to the interest rate stabilisation tool(1) of the Ducroire. Under a supplier credit, the exporter grants the foreign buyer extended payment terms. These payment terms are usually materialised by bills of exchange, which are drawn by the exporters on their own order and accepted by the foreign buyers, and possibly guaranteed by the buyer’s bank. In some countries, promissory notes are more likely being used and issued by the buyer. As a credit provider, the exporter normally seeks to be covered against the risk of payment default of the foreign buyer. Besides the non-payment risk, the exporter is also exposed to the risk of contract termination by the buyer prior to delivery (cancellation risk) and the risk of unfair calling of bank guarantees, issued on the exporter’s instructions. These risks may also be covered by the Ducroire. In most of the cases, the exporter may wish to transfer to his bank the financing of the extended credit terms offered to his customers. This kind of refinancing will either take the form of a discounting operation with or without recourse against the exporter. If the refinancing is done by the bank, then the latter will become the beneficiary of the insurance policy. The Ducroire covers the risk that the customer defaults in whole or in part on the supplier credit or only lately repays the debt, either due to political or assimilated risk (risk of currency transfer, war, revolutions, natural disasters and risk of expropriation or government action) or from commercial risk. This insurance may also apply to other forms of medium- and long-term credits linked to export transactions such as the operational leasing. Via its bank, the exporter may offer deferred payments at a fixed interest rate, thanks to the interest rate stabilisation tool of the Ducroire(1). (1) A material advantage of a buyer credit guaranteed by the Ducroire is the possibility for the exporter to offer a fixed interest rate on the loan via the lending bank. Therewith, the buyer may anticipate the financial burden which will be incumbent upon him over the whole credit period. The minimum fixed interest rates to be charged are laid down by the OECD Arrangement on the basis of the CIRR (Commercial Interest References Rates), which are set monthly. The Ducroire’s intervention consists in the difference between the guaranteed stabilised interest rate (CIRR) and the rate which banks have to pay for their refunding on trade markets (Euribor or Libor), to which is added a banking commission/margin. The Office du Ducroire may cover the bank guarantees the exporter has to arrange in favour of the buyer in order to guarantee his contractual obligations. In some cases, the beneficiaries under such guarantees can claim against them “on first demand” without having any proof of the exporter’s fault. The Ducroire’s insurance of contract guarantees protects the exporter against both unfair calling of the bonds and calling due to a political event or decision. Guarantees that fall within the scope of the cover are bid bonds, advance payment bonds, performance bonds, etc. The exporter may be required to emit a bid bond when participating in a tender or public procurement, in order to assure the buyer against a possible withdraw of his contract offer or refusal to sign the contract once it has been awarded. The advance payment bond enables the buyer to recover the down payment made to the exporter in case the contract should not, or only partly, be performed. The performance bond is emitted in order to guarantee the buyer that the contract will be performed within the agreed timeframe and according to the terms of the contract. The insurance of contractual guarantees is generally provided under a single and common policy together with the basic insurance for the export contract. For the insurance of bid bonds, however, a separate policy is drawn up. Foreign investments, especially in emerging countries, may be related to political uncertainty. The statutory framework in such countries often lacks legal certainty and foreign investments can be affected by sudden political changes or arbitrary government action. investment loans with long-term repayment terms (from 3 to 15 years). Breach of contract, meaning the non-fulfillment or non-compliance with contractual obligations. Those may have been concluded between on the one side the investor or the company in which the investment is realised and on the other side the public authorities of the host country, or government entities or entities regulated by the government. In order to qualify for compensation, the sustained loss must be final and irreversible. The insurance normally covers the capital value, but may be extended to the investment income (interests and dividends) as well as to potential further investments. This insurance is designed for Luxembourg importers, who have to make an advance payment to its foreign supplier. In case the foreign trader is not able to carry out his commitment to deliver, he will be called to reimburse the advance received from the Luxembourg importer. 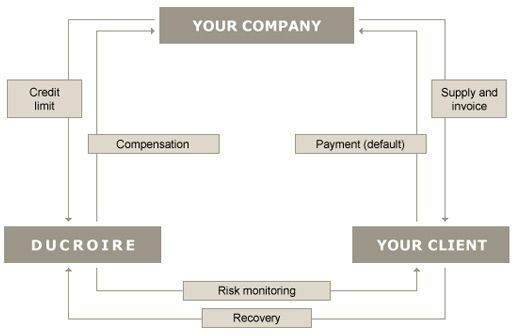 The Office du Ducroire covers the risk of non-reimbursement by the debtor of the advance and interests inherent to the contract modalities. Generally, the down payment must remain limited compared to future imports and rarely exceeds 50% of the contract value. The insurance of guarantee commitments for banks was launched in January 2015. This policy is a new product offered by ODL to fill a gap in the market. Through insurance granted by ODL, it creates leverage for credit lines that banks grant to Luxembourg companies. The Luxembourg exporter concludes a contract with a buyer abroad and needs to issue contract guarantees (advance payments bond, performance bond,…) in favor of the foreign buyer. 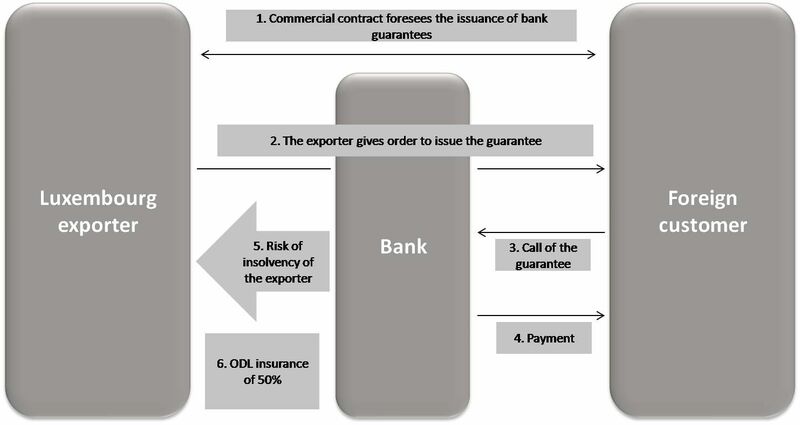 The exporter gives order to its bank to issue the guarantee. Very often however the banks ask for additional securities as for example to block the money of the advance payment on a bank account. Indeed, if the foreign customer calls the guarantee, the bank must pay the guaranteed amount to the foreign buyer on first demand. ODL covers the bank against the risk of default of the exporter. The exporter may apply for cover against unfair calling of the guarantees. A framework policy is signed between the bank and ODL. This document sets out the terms and conditions between the insurer and the insured. The exporter must be a company registered in Luxembourg and needs to be active internationally. The bank together with the exporter submit to the ODL an application for approval. ODL’s Committee decides on the acceptance of risk, the maximum insured outstanding amount and the percentage of cover. In general the percentage of cover is 50%. The Top-up policy offers the possibility to cover, on a case by case basis, an additional amount to the coverage offered by the main credit-insurer. This formula has been set up in order to complete punctual gaps between the coverage needed by the Luxembourg exporters and the coverage available on the private market. The percentage of coverage is the one foreseen and applied by the main credit insurer for the calculation of its compensation. The insured sum per debtor equals the amount of the credit limit in addition to that laid down by the basic credit insurer. In case of a loss, the Luxembourg Government will only interfere after intervention of the basic credit insurer. The private insurer will cover the first losses up to the credit limit insured by him. Only the losses exceeding this limit will be covered by the State up to the credit limit provided under the Top up policy. In this context, an envelop of EUR 25 mio has been provided by the Luxembourg Government.